A pair of Girl Scouts had a booming business selling cookies out of their driveway. Then a neighbor complained — and the city cracked down on them. According to the Times, teens Abigail and Caitlin Mills had been selling Girl Scout cookies outside their Hazelwood, MO home for six years. But then a neighbor complained about traffic and barking dogs, so the city told them to shut down their stand. 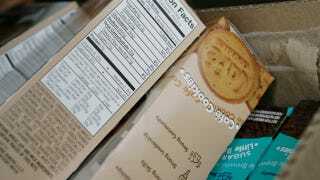 Now the Millses are suing for the right to sell cookies on their property. On the one hand, Timothy Williams of the Times is correct in his suggestion that shuttering a Girl Scout cookie operation is "a little Grinch-like." As the girls point out, their stand was only up three weeks a year, during which time many neighbors may have been psyched to have a convenient location for their fix (and why don't you sell cookies in stores, Girl Scouts of America, why?). On the other hand, the city's attorney reminds the Times that "one of the principles [of zoning] is you live over there, you work over there, you shop over there." And the Girl Scouts were most definitely working — during their three-week season, they sold their treats three hours a day on weekdays, and beginning at noon on Saturdays. The business aspect of Girl Scout cookies has always been a little strange — turning girls into little salespeople isn't quite as wholesome as, say, teaching them different knots. But the Scouts have long argued that the sales teach important skills. And Abigail Mills says her battle with the city has been educational: "It's like a learning experience." Maybe she can get a merit badge in lawsuits.